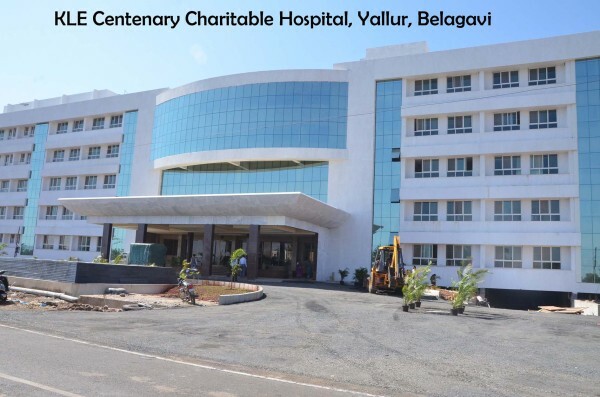 The K.L.E.Society in fulfillment of its commitment of providing health care facilities to the masses has established the KLE Centenary Charitable Hospital at Yallur Road, Belagavi South. This health care facility will serve as the teaching hospital for the USM-KLE initiative and is part of KLE’s endeavor to extend its existing health care services to the needy. The total built up area of new hospital is 285,000 Sq. Ft. It is a five storied building G+ four. The basement is equipped with Parking, Sump well, Sewage Treatment Plant. The total bed strength is 500. The Hospital provides a 24 hr Accident & Emergency Facility in addition to facilities for consultations, surgery and treatments in Neurology, Paediatrics, Nephrology, Orthopaedics, Obst. & Gynae., ENT, Burns ICU, Psychiatry and other aspects of diagnostics and treatment. It also has facilities like lecture theatres, teaching room, library, diagnostic block, blood bank, anaesthesia department, central pharmacy, mortuary, cold storage, delivery suits, 8 Operation theatre, 12 clinical departments, faculty block, administrative block, record room, server room, residents duty room, special ward areas, cafeteria and ambulance area. Strategically located in close proximity to neighbouring villages, the facility is an attempt to take state-of-the-art healthcare facilities quite literally to the doorsteps of citizens. KLES Yallur road Hospital is very good and cleaning maintain. The Doctor Nurses Security Guards etc all are doing there very good duties. We specially like Doctors are very high qualified and there languages is very good. and billing cost is very low, affordable for poor people, Its my own experience.